I am going to refrain from putting any quotes like I usually do, because all that I highlighted would be too spoiler-y! London, 200 years in the future, has fallen to ruin; thugs run the city and the good guys' numbers are limited. Skye, a not so average girl, is thrust into the center of it when she catches the eye of prominent Raphael Renzo. Raphael is a Morpher, a man who can turn into his spirit animal at will. He's also got a way with words and women, leading Skye to reveal she too is a Morpher, a beautiful white wolf. 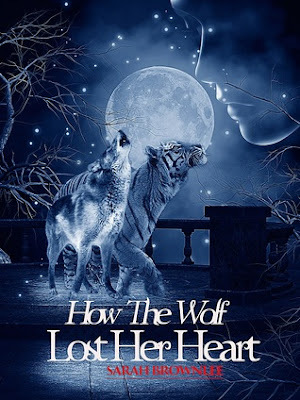 How the Wolf Lost Her Heart follows Skye as she struggles with real life under her mother's watchful eye, the struggles of accepting her morphing abilities, attracting the wrong thug attention, and falling for her fellow Morpher and joining the good guys. How the Wolf Lost Her Heart is not a dystopian in my eyes, but it is definitely a unique story among the plentiful sci-fi/paranormal Young Adult genre. Sarah Brownlee has taken a common plot line and transformed it into something very unique. I really enjoyed reading the transformation scenes, as you could really tell you'd left human life and interaction behind for that of the animal's, it's believable and very well described. I also appreciated that the novel felt like real life, with family, jobs, friends, and a divided city of good versus evil. I am definitely interested in finding out what happens next, as you are left with a small cliffhanger at the end. I wanted to give this book four stars, it is well deserving of that rating, however there are a lot of spelling and grammatical errors that just can't be ignored. If this book were to be edited and re-released I would easily up the rating. The storyline is incredibly interesting, but the spelling and underdeveloped plot need a little work. I really wanted more in the way of good versus evil and the role morphers previously and currently played in it. I wanted to understand the world London is based in now, especially how it is dystopian. What Brownlee offered in the form of Memory Transcendence made me want more, unfortunately I've got to wait for book two. I also have a bit of a problem with Skye, she reads as much younger than her age. She can drink, work, and go out on her own, yet she reacts quickly and rudely like a teen in high school would. I recognize this was done on purpose, as she is called out on this by Raphael, but it still felt forced. I think these are all parts the author could improve upon easily and I expect we will see some more world building in book two. I would definitely recommend this to fans of this genre, it could easily be enjoyed by those in the younger range of YA, as well as those who are older in the New Adult generation. I will be sticking around for book two, as Sarah Brownlee has me hooked on knowing what happens, not only to Skye and Raphael, but to London as a city. I think this was a great first novel from Brownlee and I think we will be seeing a lot more from her.